Just finished watching Van Veen’s ringlighting video. Not an exceptional speaker (Van Veen), but I learned a lot. I, for one, never knew a full-size ring light was that big. I see a lot of potential in learning on this site. Thanks for introducing me. I, of course, am very interested in the free subscription. Hoping the random gods favors me on this one. 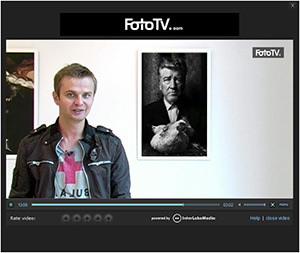 there a really intersting videos at FotoTV…so I reallly would like to win a one-year subscription! I would very much like to be entered for the raffle! 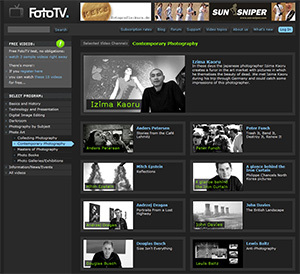 Awesome site this foto.tv! Yeah, I’d love a subscription to that site. There’s some good content on there. Good AND free? I’m in! This is the one place you can watch all of the Fred Picker videos. Great stuff for film shooters and some info for digital photogs too. The complete set of Zone VI video tapes in not quite up but sections are added as time goes on. The DIY studio stuff is interesting, but some of the light fixtures are not available here. Neon = fluorescent. Some good history videos in there as well. If content were added faster (and a little more regular) the subscription price is not all that bad. I have the new video announcements on RSS. I would love a sub as I am unemployed and can no longer afford “luxuries”. Great resource. I am looking forward to more videos coming soon. Would love a one year subscription. I registered and have access to 15 free videos. They look like they will be really useful. So…I would love to have a years subscription. Please enter me into the Raffle. I’d love to be in the raffle. Thanks for the article and raffle, this is a great site. Thanks for sharing the info about this website! Seems very good! Enter me – looks like a great resource! Watched the video on replacing sky – really easy to follow for a photoshop lightweight like me. Please enter me in the drawing. This looks great! Great site. I’d love to see all their videos! WOW! I want a subscription too!